Koh Tao is the home of scuba diving in Thailand, a small and enchanting island hidden away in the Gulf of Thailand it is resplendent with hidden underwater treasures. Divers and snorkelers are truly spoilt for choice when it comes to Koh Tao thanks to the impressive variety of marine life. Home to the mighty Barracuda and Grouper and seasonally visited by the majestic Whaleshark. If you really want appreciate the beauty of this magical island then Scuba Junction is for you. 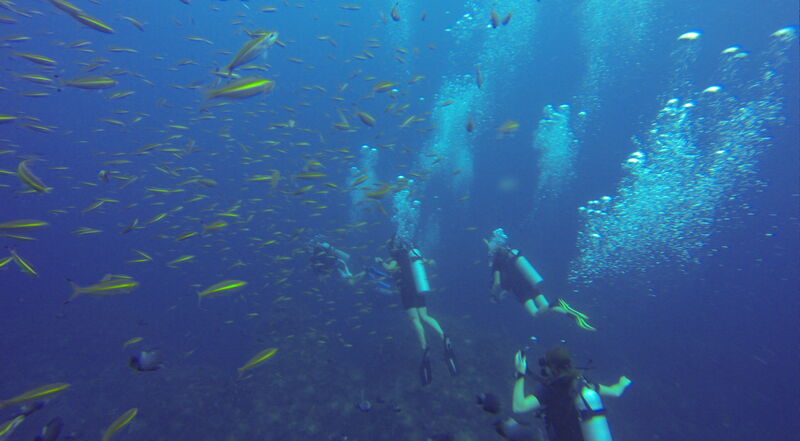 It is the ideal place on Koh Tao to combine a tropical holiday with and exhilarating scuba diving experience and whether you are a complete novice or experienced diver, they are perfectly situated in the middle of the beautiful main Sairee Beach to ensure you get the best diving experience. Each and every dive group (courses and fun dives) are limited to a maximum of four divers to ensure close supervision and a more enjoyable time under water. As still the only dive shop on Koh Tao, they offer free use of New Suunto Dive Computers, Compasses and Optical Lenses to add extra safety to everyone's dive planning. Scuba Junction’s team is passionate about diving and want to share that passion with you as you undergo your underwater adventure. It all stems from manager, Natalie, whose infectious personality has inspired the staff and students alike. A total fitness freak, if she isn't at yoga, pilates, paddle boarding, hiking, swimming, running, or flying trapezing then you will find her training hard at the Muay Thai Boxing Stadium! So if you are after something other than diving while you stay in Koh Tao, Natalie is sure to point you in the direction of some other awesome adventure activities. Scuba Junction offers both SSI and PADI dive certification. If you are a total novice then Scuba Junction offers an excellent Introduction to Diving, an experience that will give you a taste of what wonders lie beneath the blue tropical waters that surround Koh Tao. Travellers flock from all over Southeast Asia to take their first breaths underwater in the coral reefs of Koh Tao and Scuba Junction offer a plethora of Dive Sites for you to marvel over.